Sri TIWARIJI has more than 40 years’ experience in Yoga therapy and teaching. Through him we can come into contact with the living tradition of Indian Yoga as he received it from Swami KUVALAYANANDA himself. 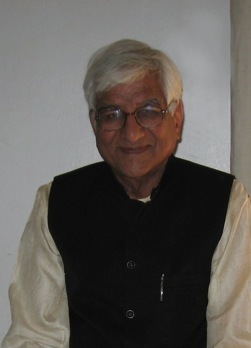 Born in North India in 1933, Sri O.P. TIWARI studied Economy then Hindi and Sanskrit. He received his training in Yoga under the guidance of Swami KUVALAYANANDA at theKAIVALYADHAMA Institute in the state of Maharastra. Totally committed to Yoga and to the Institute he took on the responsibility of Manager of the Yogic hospital then of Secretary General for the Institute, at his master’s request. At his insistence, the Indian Government decided to include the ancestral science of Yoga as a part of the school curriculum for young Indians. Sri TIWARIJI has more than 50 years’ experience in Yoga therapy and teaching. Through him we can come into contact with the living tradition of Indian Yoga as he received it from Swami KUVALAYANANDA himself. His goal being none other than to selflessly pass on the practice as it has been done by adepts over the centuries in India. Performed with patience and integrity these authentic practices bear infinite fruits. Being himself dedicated to a life of incessant practice, Sri TIWARI embodies wholeheartedly this magnificent yogic energy and he transmits it with plenty of clarity, empathy and kindness.